Warning: Spoilers for anyone who hasn’t played the first two episodes. 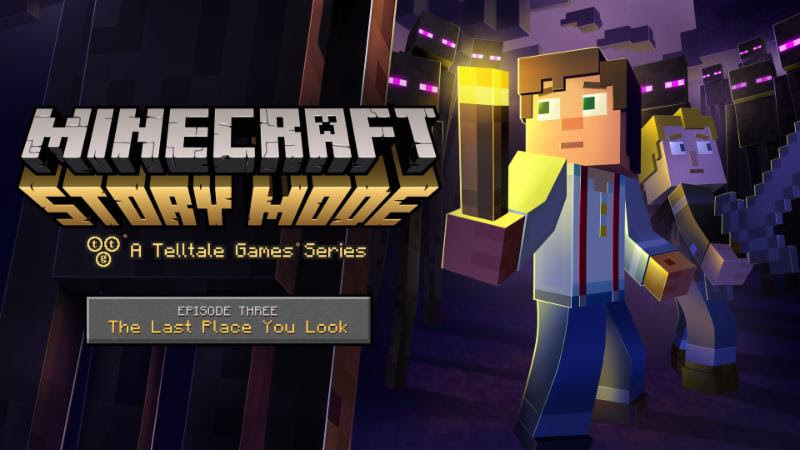 Right off the bat, “The Last Place You Look” establishes itself as an action-packed episode, taking full advantage of QTEs and the diverse collection of creatures the “Minecraft” universe has to offer. There are still those quiet moments where dialogue overpowers all, but it’s no longer meaningless chatter. The fate of the world is in your hands, and the pressure really starts to weigh down as the search for Soren, the final member of The Order of the Stone, continues. On top of that, Gabriel (or Petra, depending on whom you saved in episode one) is growing incredibly ill and doesn’t want Jesse telling the rest of the group. Soren (played by John Hodgman) is a nice edition to the group of unlikely heroes, especially because some of these heroes have lost their flares — Axel finds his way to the background, and Magnus and Ellegard are absent for most of the episode. But Soren, the genius with some serious social issues, fits right in with Jesse’s group. And it’s definitely Jesse’s group now. Telltale has been shaping Jesse to be a leader, and his or her nobility truly shines in “The Last Place You Look.” From fighting at the helm when being overrun by monsters to dealing with the assembling of The Order of the Stone, Jesse stands front and center in episode three, taking on all the dirty work … and an uncomfortable number of Enderman. Telltale’s really beginning to get the hang of writing for family friendly audiences. “The Last Place You Look” is the first episode in the series that doesn’t make you painfully aware of Telltale’s struggle with language restrictions. Not only that, but the quality of the writing in general has gotten better. Middle episodes in any episodic series are tricky. You have to keep people interested and push the story forward while saving all the good stuff for the big finish. The ending to “The Last Place you Look” introduces some serious problems for Jesse’s gang and leaves gamers on an unexpected cliffhanger. “The Last Place You Look” is easily the best installment in the series. The episode offers the most memorable moments in the series yet, and its ending will surely leave you feeling all sorts of emotions. The series got off to a rocky start, but it’s finally built a foundation to build hope for a successful end to the season. With only two episodes left, there’s a lot of pressure for Telltale to get this right. But as long as the game follows down this new path, it should have no problem realizing its potential.